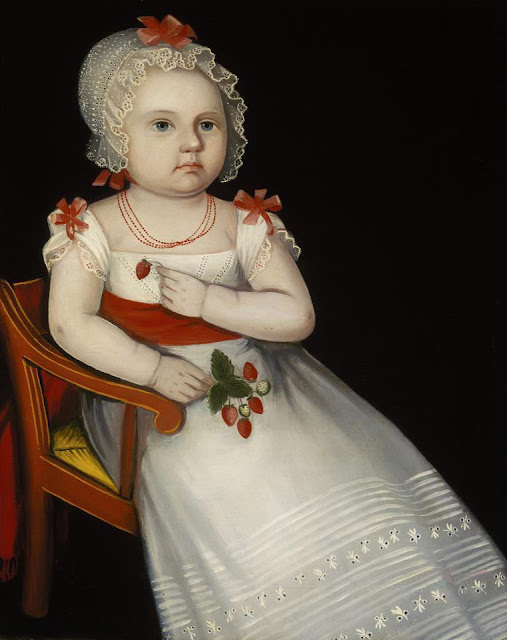 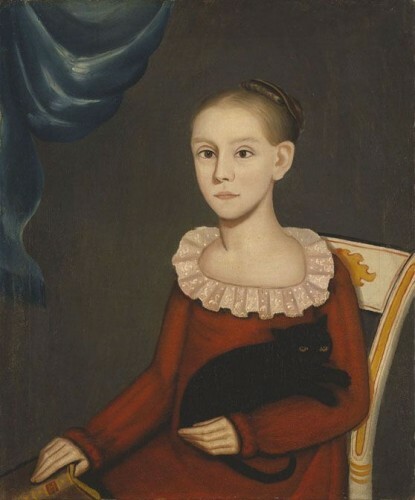 Continuing a major series on American Folk Art featuring 21 postings. 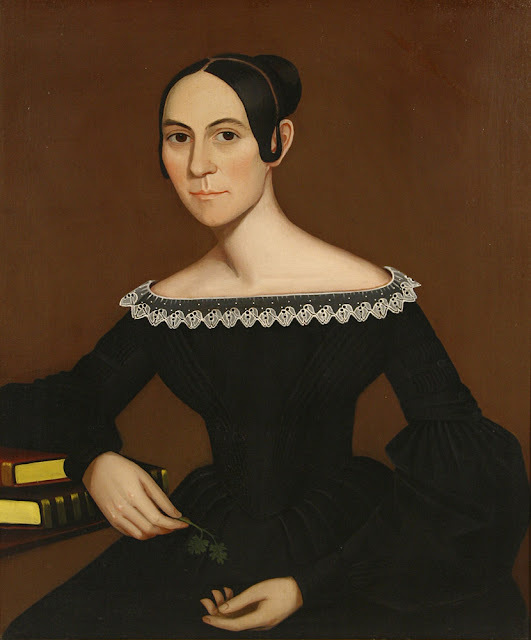 Folk Art encompasses art produced by artists and ordinary folk with little or no training in the arts, and is traditionally utilitarian and decorative rather than purely aesthetic. 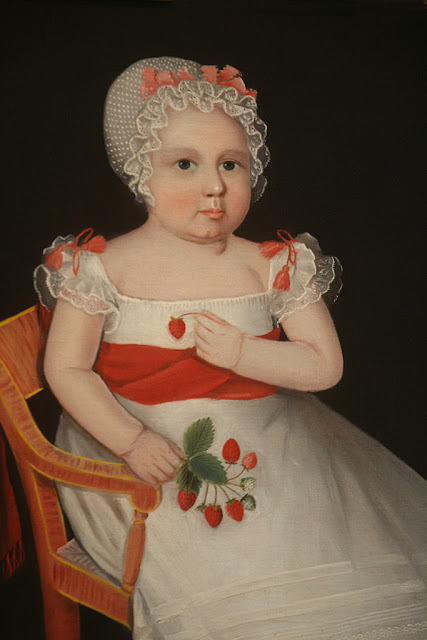 The period I’m covering is the C18th and C19th. 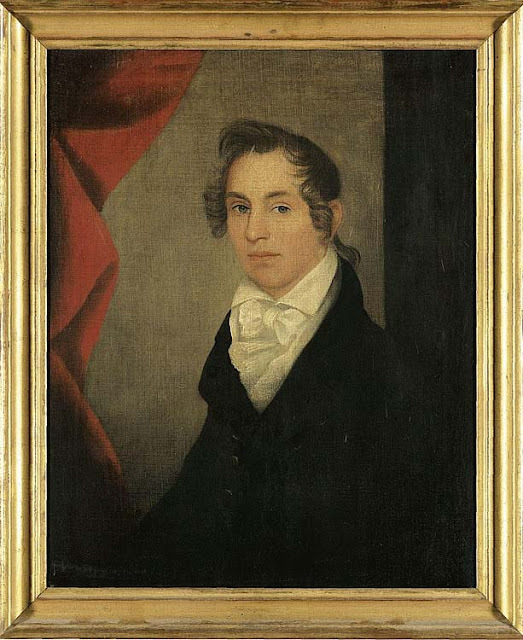 See parts 1-8 also for earlier works. 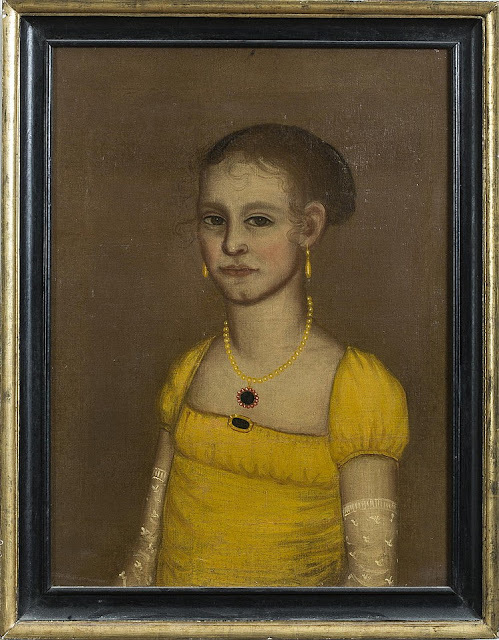 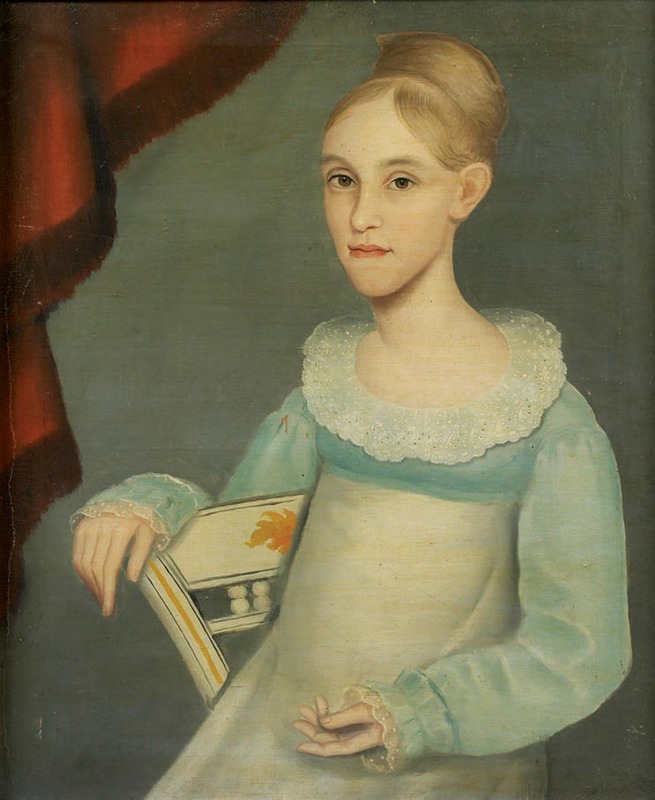 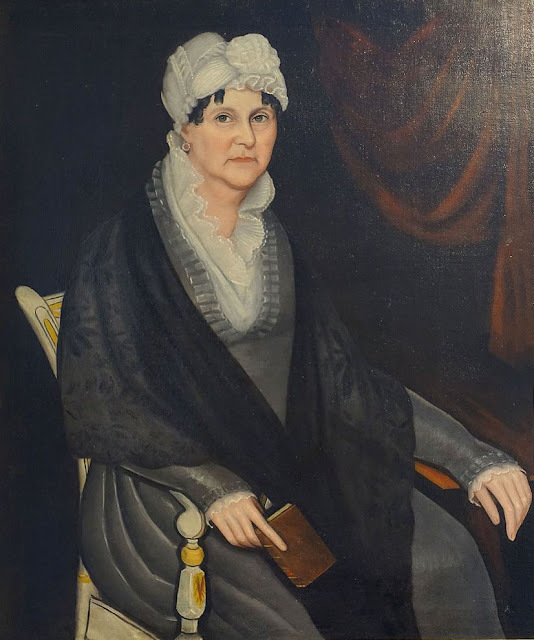 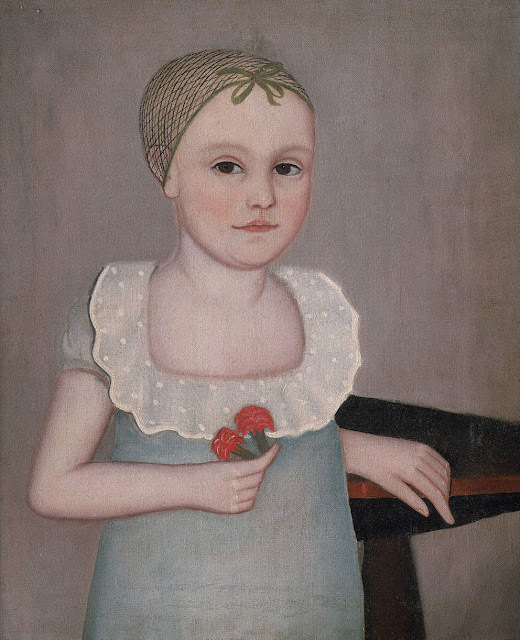 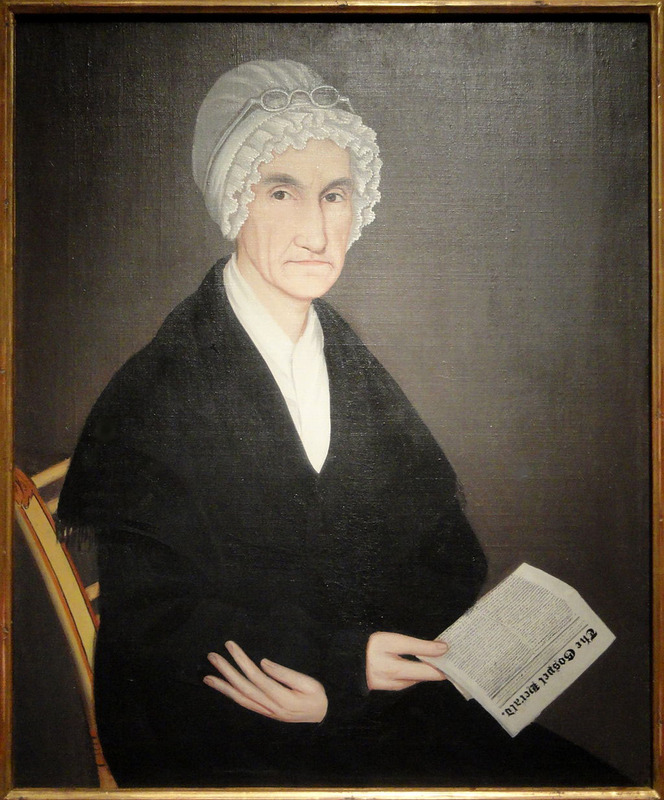 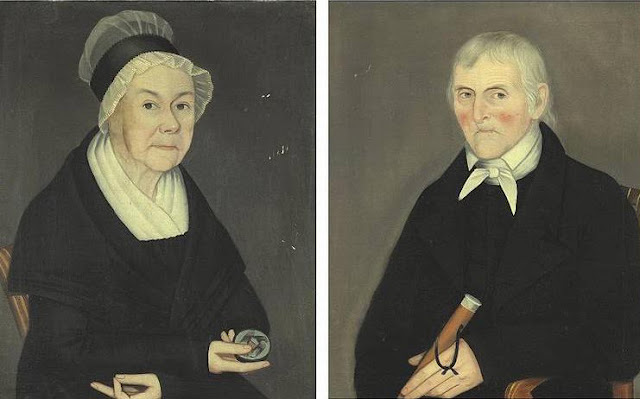 In 1924 a summer fair in Kent, Connecticut, sparked the rediscovery of a major American artist when local residents put several nineteenth-century “ancestor portraits” on display. The strikingly similar canvases depicted graceful women with long slender necks leaning slightly forward within gleaming dark backgrounds and firm men in dark suits, often holding newspapers or books in their hands. 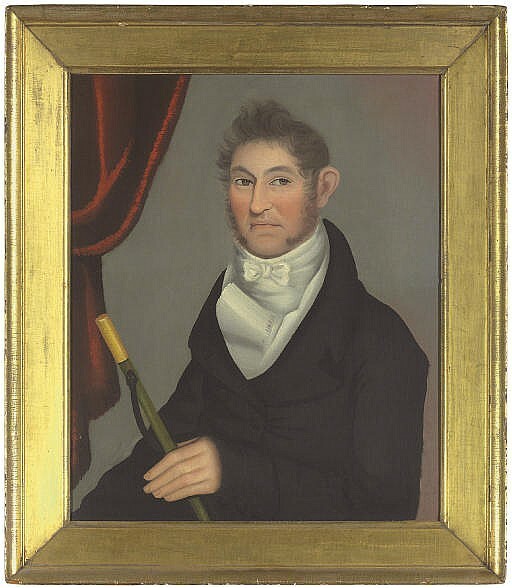 The artist, who was then unidentified, was given the appellation “Kent Limner.” It was not until 1965 that Barbara and Larry Holdridge, with the support of Mary C. Black, convincingly demonstrated that the Kent Limner portraits were linked to several other disparate bodies of work and that all, in fact, were painted by a single artist - Ammi Phillips, at different points in his career. 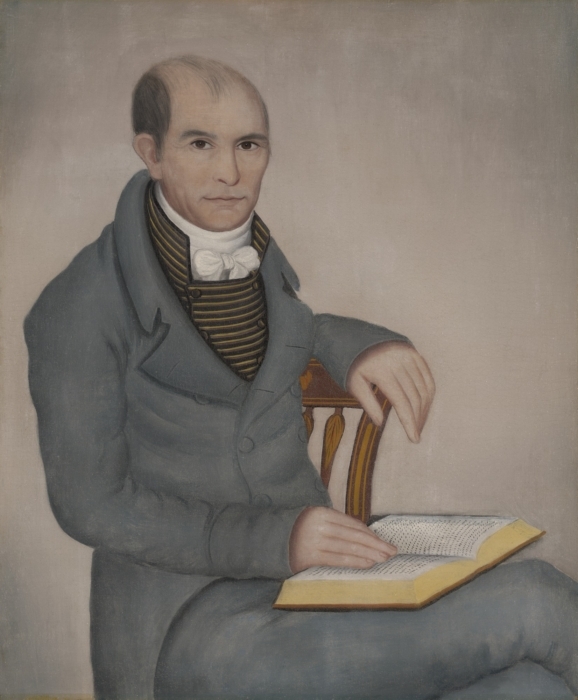 For more than fifty years, Phillips—whose biblical name fittingly means “my people” portrayed hundreds, perhaps thousands, of his friends, relatives, and neighbours in New York as far north as Ticonderoga in the Adirondacks, south to Bedford, in Westchester County, and throughout the border areas of Massachusetts, New York, Vermont, and Connecticut. 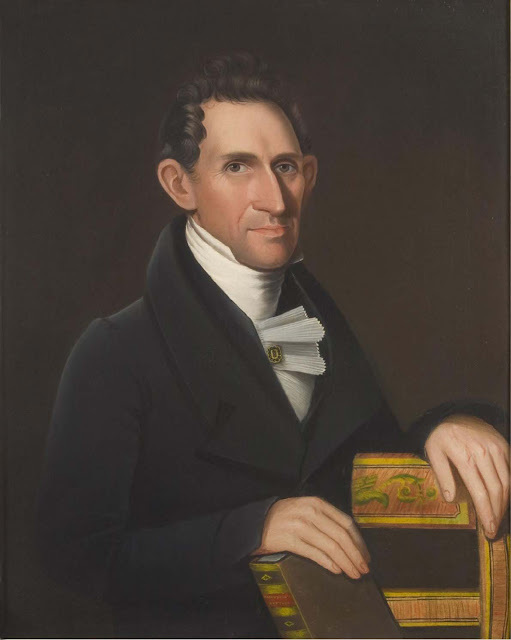 Phillips was born in Colebrook, Connecticut, in 1788. 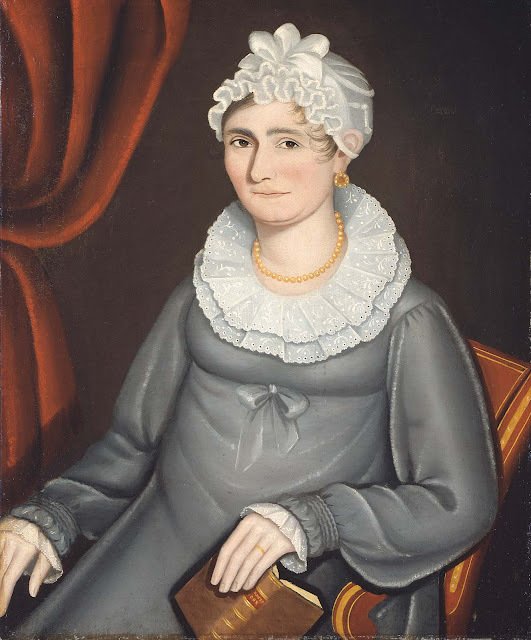 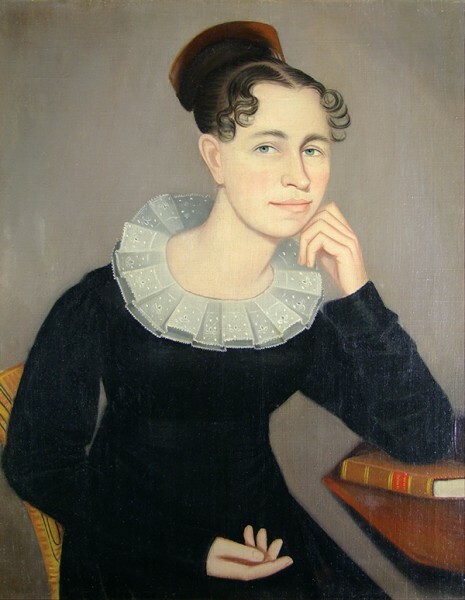 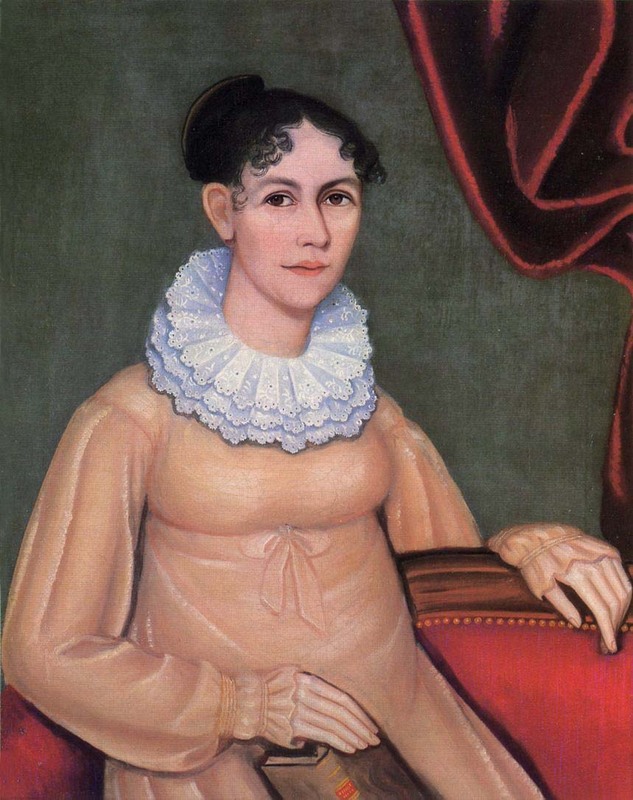 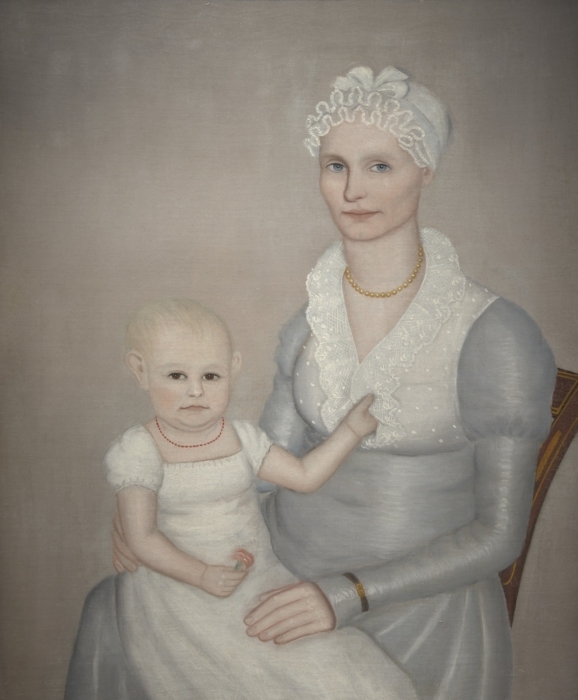 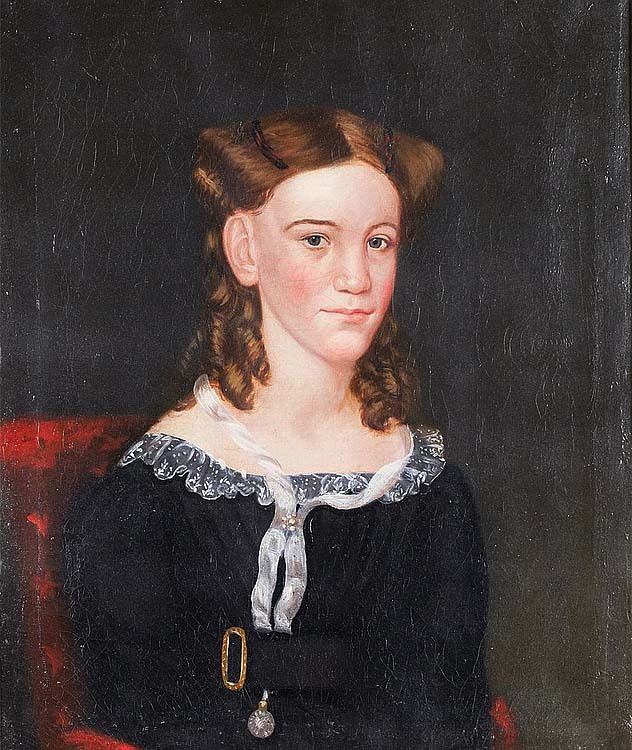 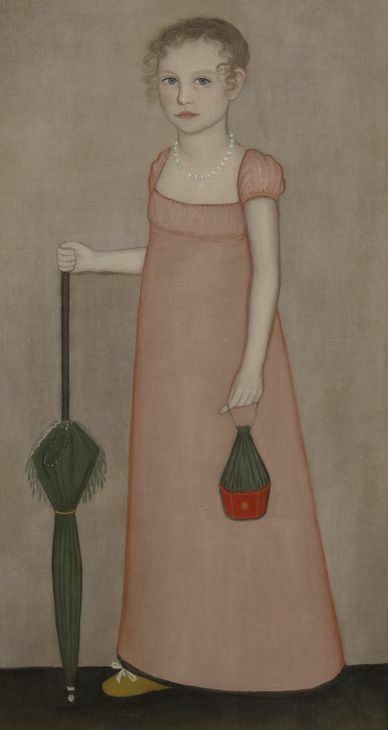 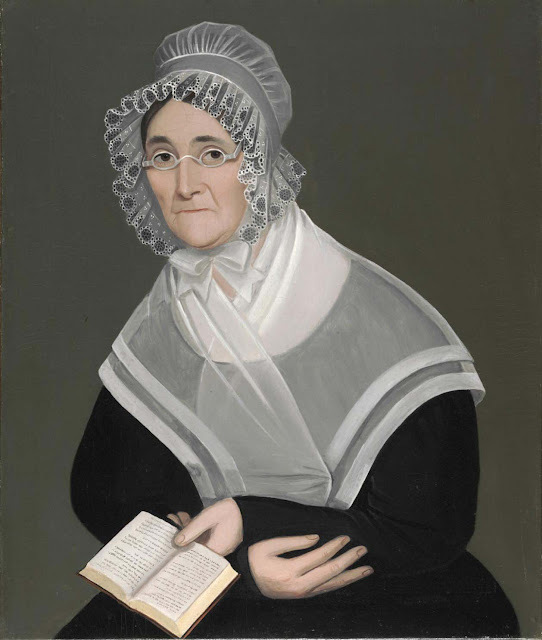 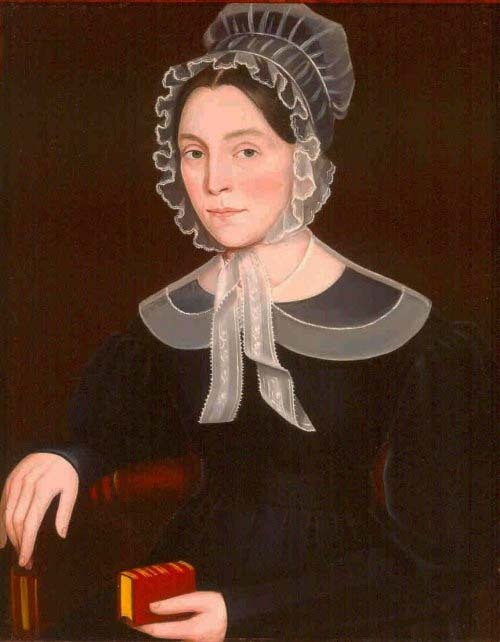 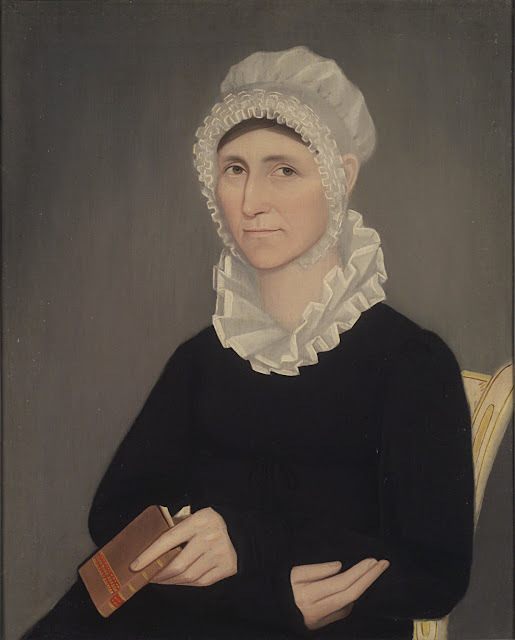 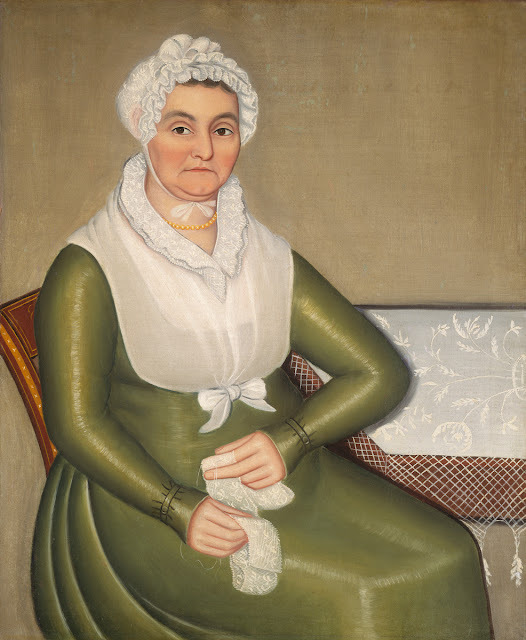 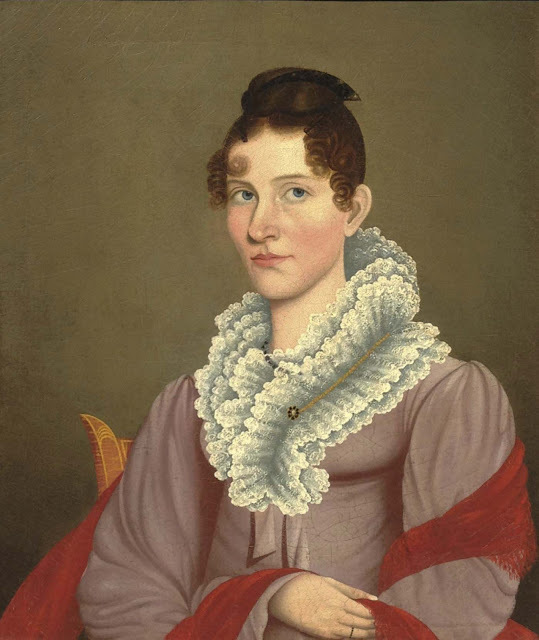 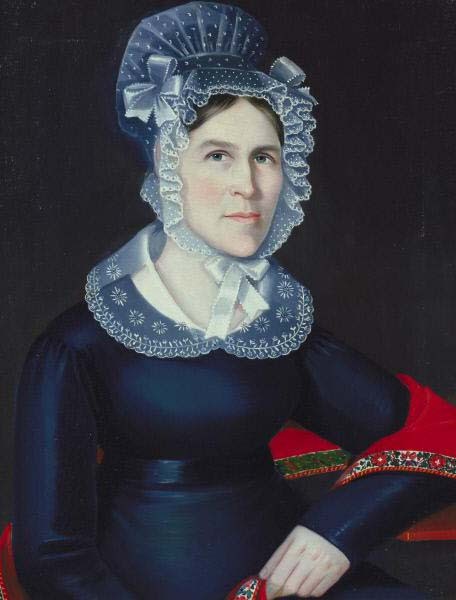 He was already travelling as an artist by 1809, when he advertised from William Clarke’s tavern in Pittsfield, Massachusetts, that he would paint “correct likenesses.” This promise became a leitmotif of Phillips’s work over more than fifty years, from the early romantic portraits of Harriet Leavens and Harriet Campbell—who appear in the guise of fashion plates replete with Chinese silk parasols and reticules - to his last portraits of the 1860s. From 1829-1838, Phillips (1788-1865) changed his style to what is now known as his Kent style. 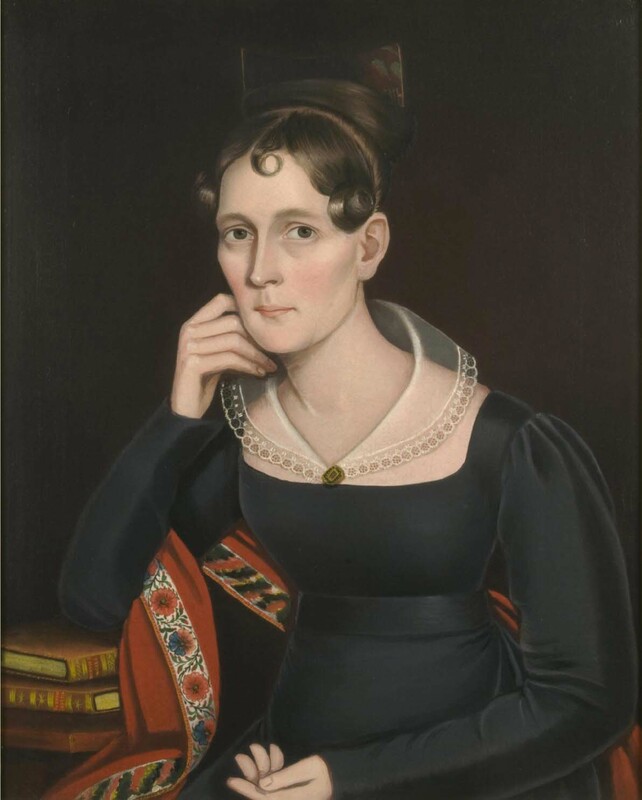 Phillips' paintings from 1829-1838 are in a new style, infinitely more languid and more highly stylised than any of the likenesses of 1820 to 1828 or the romantic visions of his Border period"
(Barbara C. and Lawrence Holdridge, Ammi Phillips: Portrait Painter 1788-1865, 1968). 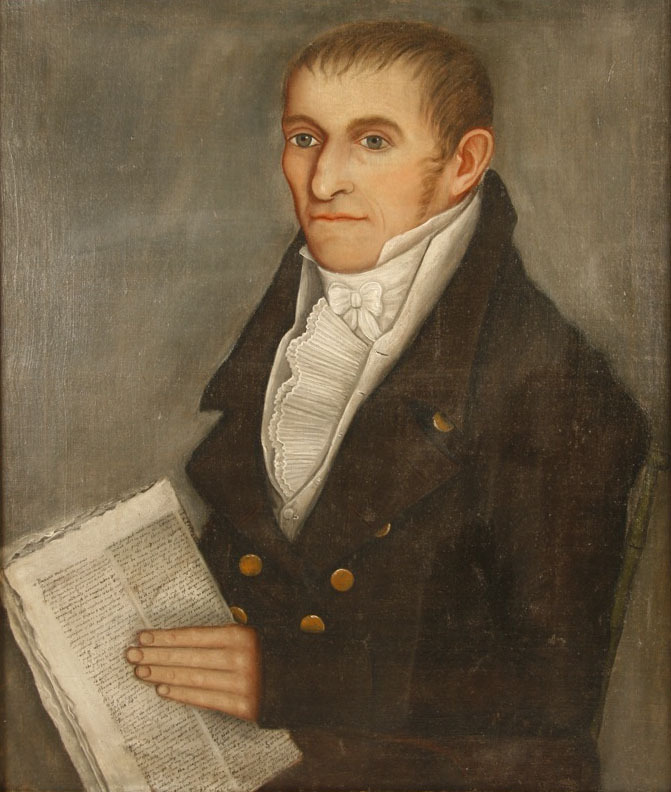 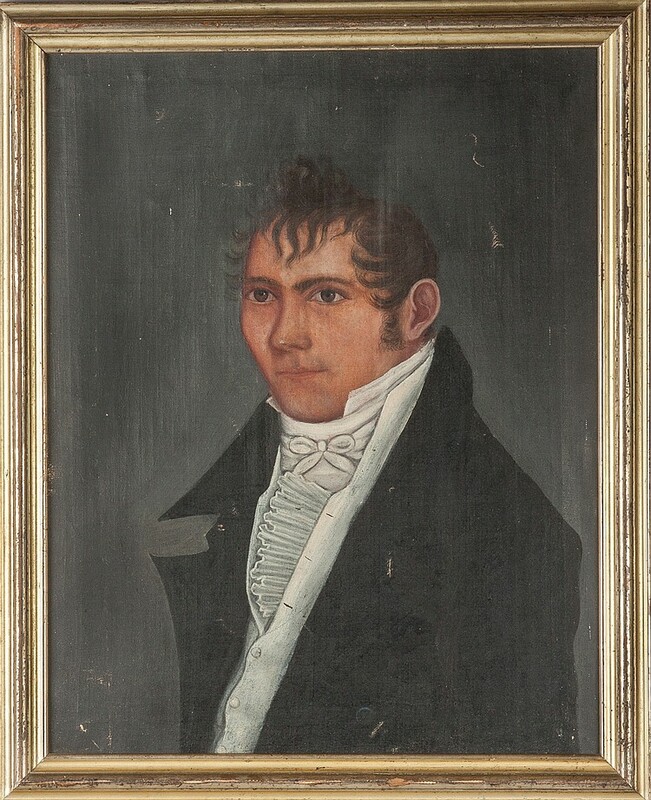 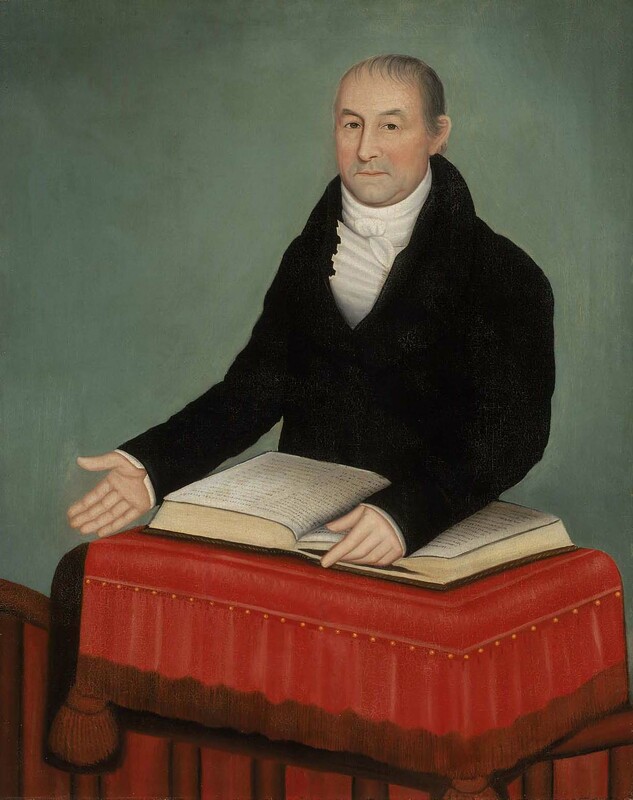 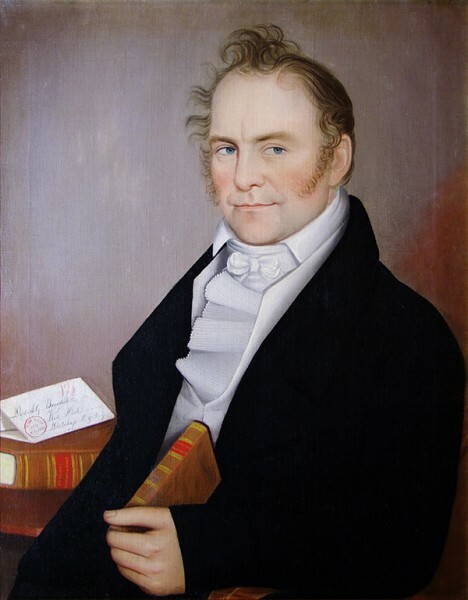 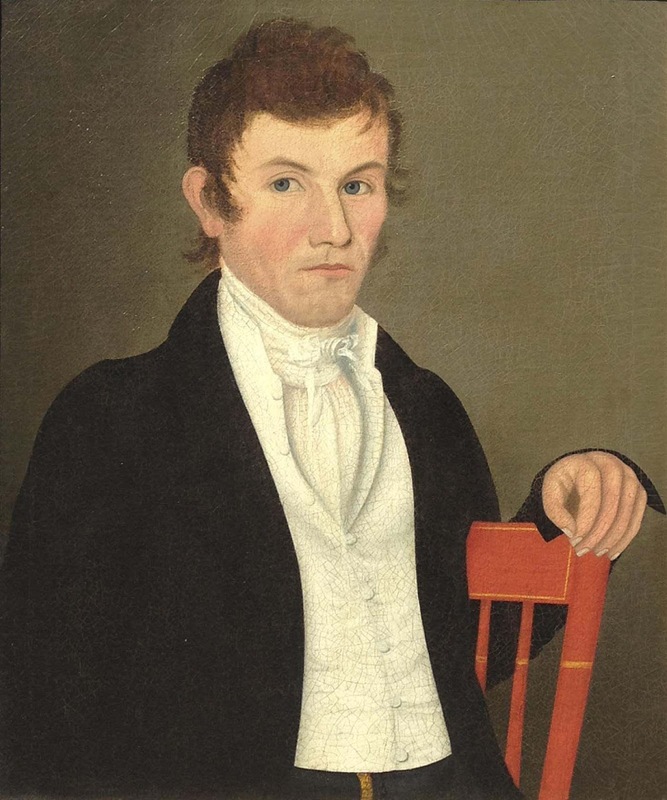 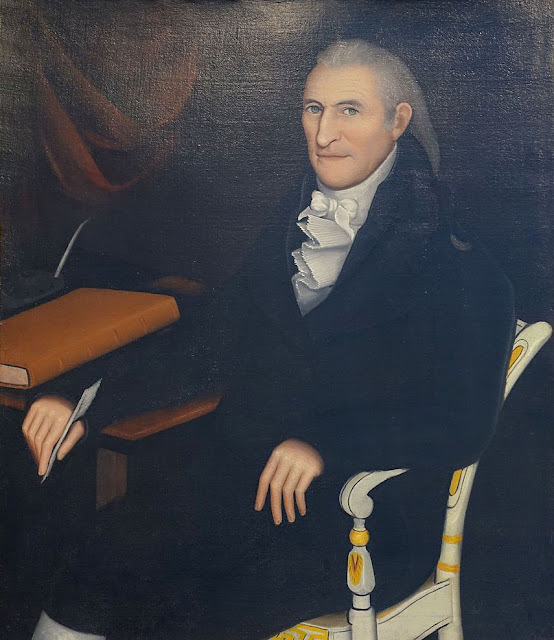 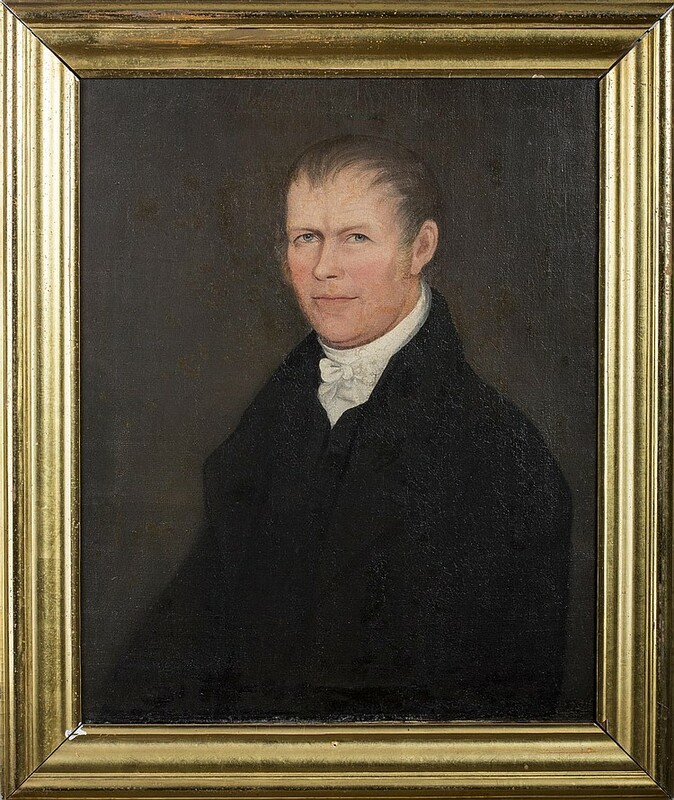 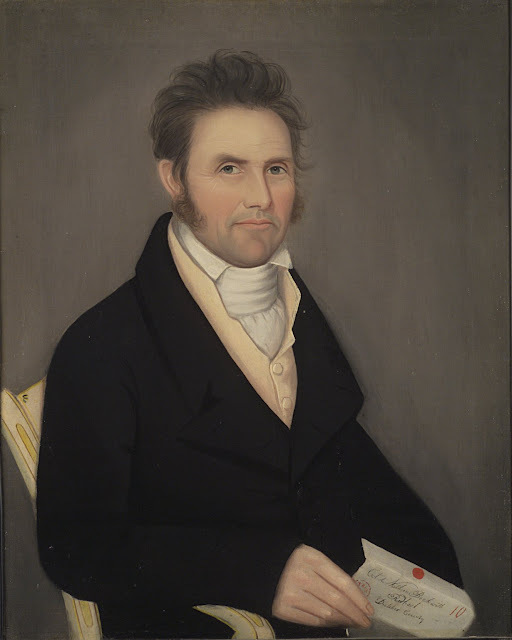 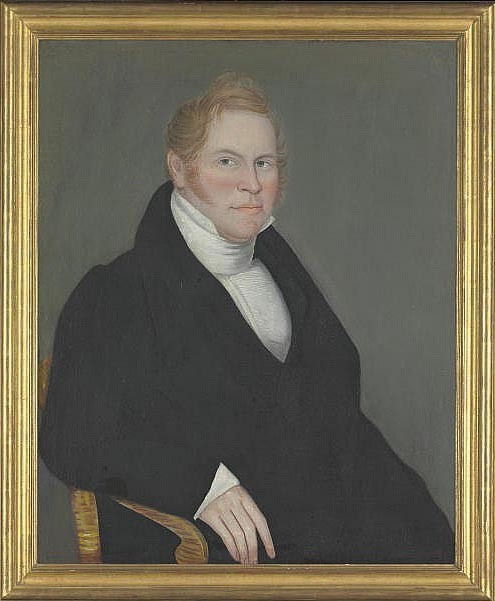 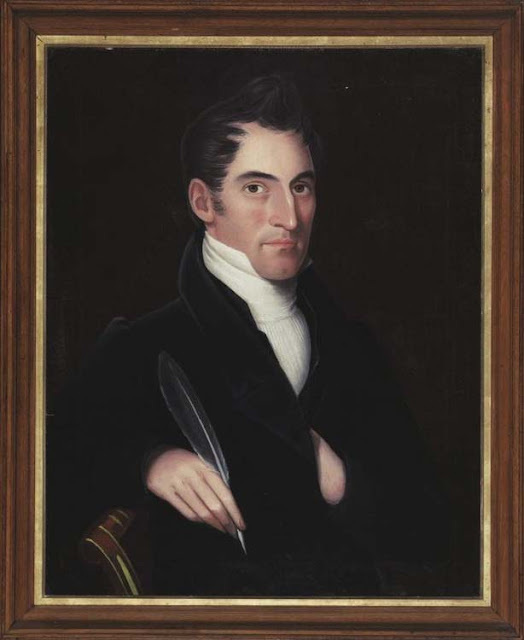 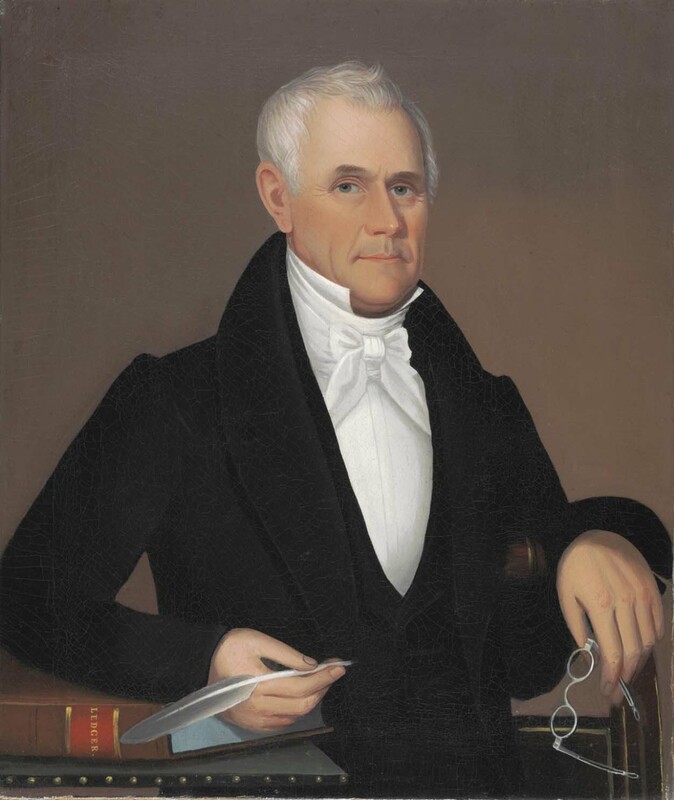 1821 Portrait of Dr. John McClennan of Livingston, New York inscribed "John McClellan Aged 48 1821/ Painted by A. 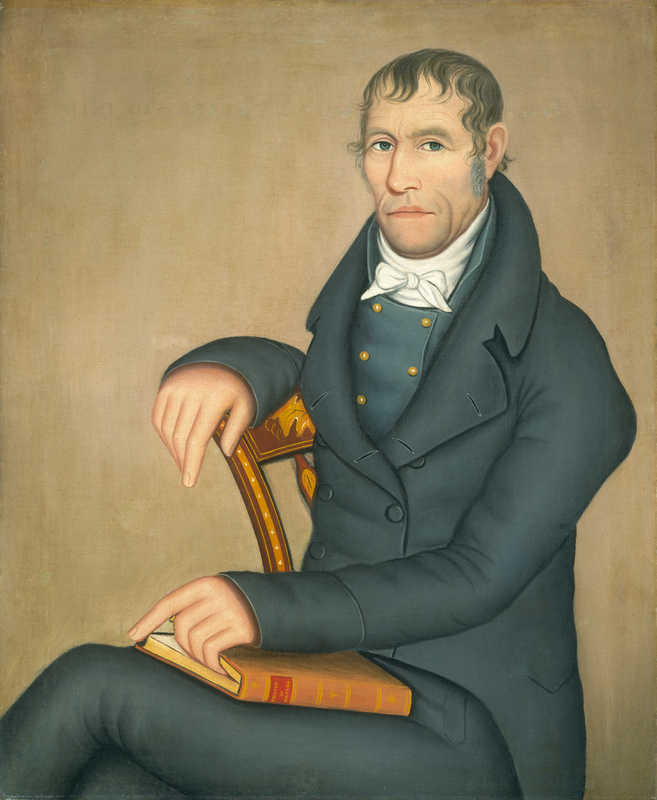 Phillips." 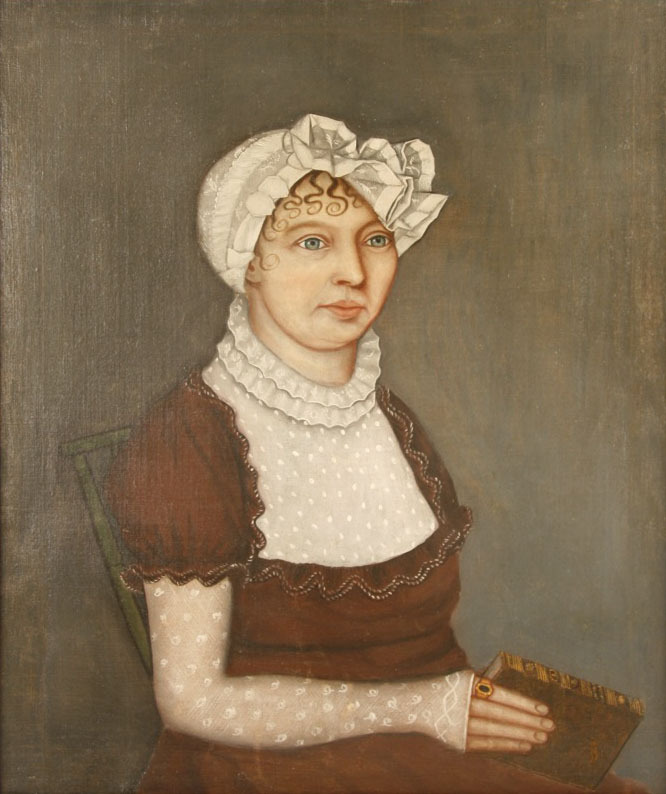 oil on canvas 58.4 x 71.1 cm.